Recently my best friend Ashley saved the life of this beautiful husky malamute mix, Locket. This story visually represents the strong bond these two have and their story of rescue. One day Ashley and Sam went to the Contra Costa Animal Shelter and met Locket behind a cage. Ashley says, "We went to the shelter hoping to take someone home that day :) but ended leaving pretty disappointed and frustrated. There were two dogs we had our eye on after walking through the facility... One a Husky that had arrived that day and a husky mix that was flagged as problematic and scheduled to be put down in a week. We got the ID numbers for both dogs and followed up with the shelter over the next week. The first dog was a run away and ended up going back home to its owner while the second dog, Locket was unable to be adopted due to liability and was still scheduled to be put down even though we had expressed interest in giving her a home. The staff at the shelter didn't care one bit that this poor animal was going to die. The only help were the volunteers, the selfless unpaid handlers that come in for free to brighten a few dogs days with simply a walk. They had preformed the personalty test for Locket and unfortunately she had failed due to being too shy and timid, along with the bad rap the previous owners had given her as they surrendered her. They said that there is too much liability to the city if they were to knowingly give a troubled dog to the public... That in order to become Locket's family we had to have another rescue organization pick her up and give her to us taking the responsibility of what the dog does away from the shelter. So I contacted Gail from Norsled... And when I say I contacted I mean I emailed, voice mailed, texted and redialed Gail's number until I got a response, lol. She said she was really busy and on the road so she couldn't talk. But knew my story and wanted to help even though she was on overflow with all the dogs she already had to find homes for. This was one of my first shoots on the project Rescue Tales. 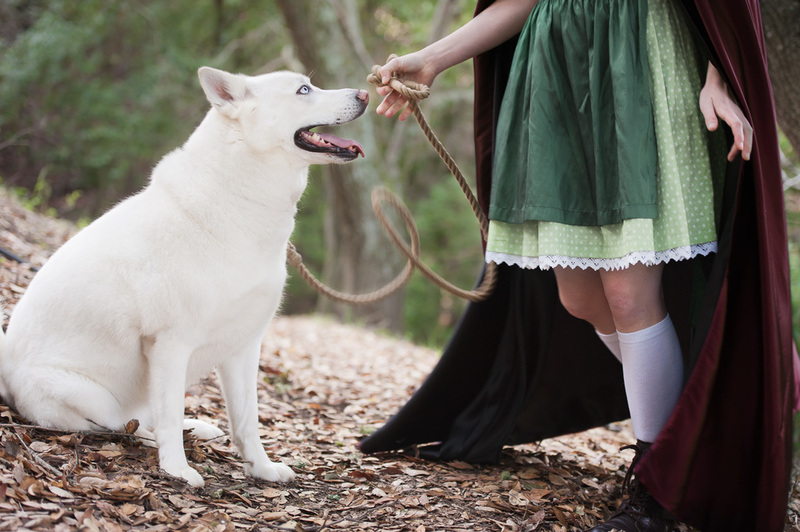 It is inspired by Little Red Riding Hood and white wolf. In the fairytale, the wolf always wants to attack Red Riding Hood. In this story, I wanted to show that they could be friends. Red holds a loose leash, which symbolizes trust between the two. Red is not leading the wolf, but they are going on an adventure in the forest side by side. The leash is from an amazing company called Found My Animal, based out of New York. Their goal is to help raise awareness of the urgent need for animal adoption. They are fabulous leashes, do yourself a favor and get one, you won't regret it!